YOU GUYS, I found the cutest little sewing box and I am so excited to give it away this week for Free Stuff Friday! It doesn’t matter if you are a sewing enthusiast or just need something around to help you sew on buttons, this kit is perfect for anyone! So hurry and ENTER TO WIN! 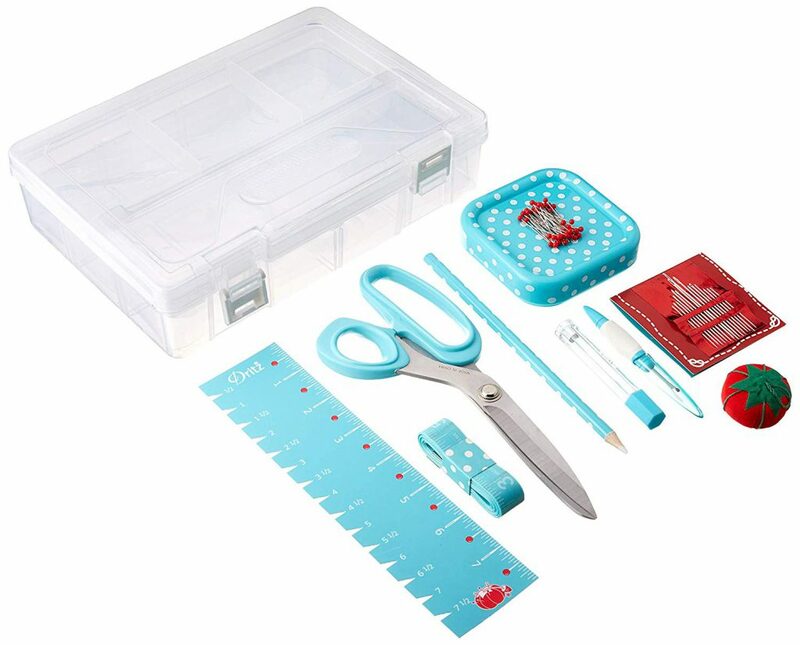 Dritz Sewing Box Kit is a plastic storage box with removable tray. It contains all the basic supplies needed to begin your next project (a pair of 8 1/2 inch shears, a pin magnet with 45 1 1/4 inch glass head pins, a seam ripper, 15 hand needles, a needle storage tube, 60 inch tape measure, 2 x 8 inch ruler, white marking pencil, and cherry tomato pin cushion). Perfect for beginners or experienced sewists. Question of the week: What’s the most random thing in your purse/wallet? This entry was posted in Crafts and tagged Free Stuff Friday!! on November 30, 2018 by Kimberly. The most random thing in my purse right now is 3 rubber bands. I keep thinking I will take them out but somehow I never do, it just seem that I might need 1 for some reason one day lol. The most random thing in my wallet is a guitar pick. The most random thing in my purse is a slip on spurs for when I ride my horse. I keep my purse in the locked car and since it is always with me, so are my spurs. I have a lucky rock. The most random thing in my purse is not one book light but 2. I bought them to try a month ago and still haven’t taken them out yet. The most random thing in my wallet is a four leaf clover. I keep it hoping it will increase my money but it never does(lol). Two different flavored Burt Bees Lip Balm. A Steeler game ticket from seasons ago. It’s a reminder of a great time. This might sound odd but mine is a 32 bullet that use to be for my late mom’s gun. A yearly license plate sticker I keep forgetting to put on my license plate, oops…. the most random thing i have is a pretty crystal for luck and good energy! A car starter for my van. I keep forgetting to use it. I have a set of Allen wrenches in my purse that I borrowed from my fiancee. A tiny jack knife, a gift from my late step-son. My late husband would never let me touch his jack knife but my step son said a girl should have her own. Happy memories for me now. The most random item in my purse right now is pink bottle of pepper spray. The most random thing in my bag is a lint roller. It comes in handy. I wear black pants a lot. The most random thing I have in my purse is a newspaper clipping of y mom’s obituary! A business card from my granddaughter’s pediatrician. My daughter wanted me to keep it in case there was ever an emergency when I stay out there with them. The most random thing is a small pack of hearing aid batteries. I keep my wallet as thin as possible, so the only “random” item in WAS my recently expired DL. I just stuck the new one in and didn’t pull the old one out ’til now. Thanks for the reminder. I have an Ohio buckeye in my purse that has been there for many years. Supposed to be good luck. My blackjack card that tells me what to do when playing blackjack at a casino. Never know when I might be close to one. Nothing random in my purse, its tiny! Oddest thing though is a worry stone that I always forget is there and worry anyway. The most random thing in my purse is my Swiss Army knife. Never know when you’ll need one. I have a metal coubaton which I would use to beat up anyone who try to acoust me. Sorry for the spelling but you get the message. My dad’s old driver’s license. What a fun giveaway! This would be really handy! The most random or unusual thing in my wallet… I carry a Disney Dollar that I got many years ago at Disneyland! A small Multi-tool! I came in very handy the other day. I think it is a shoe horn- you never know when you will need one. Really cute and a great product to have if you’re a sewer. Everything in my purse has a use. 🙂 I suppose the most random thing might be a very lightweight hat/band to wear when it’s windy and my short hair looks ridiculous. I have everything in my purse,but the most random thing is a wheel of dental floss,because you never know! Oh gosh, I just cleaned out my purse but guess I would say a coupon for $4 off a haircut. Love this sewing kit and sure would love to win it. Random things in my purse, a beautiful rosary to help me pray and a pink tin with a flower rinstone,inside homemade lip balm from my grand daughter. The most random thing I keep in my purse is a measuring tape. I have 5 dogs all that are different sizes and I am always looking for a sweater for them. I have my passport & my two sons’ passports. You never know when an opportunity for adventure will come along & you have to jump on it! The strangest thing in my purse is a a copy of my birth certificate. I needed a copy about 10 years ago and have never taken it out to be shred. It would have to be my peppermint candy. I’m a diabetic it pays to have it. Mini tape measure. Had to measure I table I was buying and it never found it’s way out of my purse. A ring I wore one day and took off when I went to the gym. I keep forgetting to take it out of my purse. A very small screwdriver. I can use it to tighten a screw, pry something gently, scratch off that grey covering on gift card PINs or scratcher lottery tickets, mark my place in my book…oh so many little things it can do! I recently got a really big purse well I knew it was a bit heavier as me and my daughter were walking into the orthopedics office today. After signing my daughter in I discovered her extra shoe she had thrown in my purse as she had planned on coming out of her boot she’s worn for 9 weeks from where she had broken her foot and 2 toes. The most random things in my backpack (which I use to carry my oxygen tank and wallet in) is a pair of clean undies because you never know when you will need a pair and a mini tube of Crest in case I have to go to the hospital. I strongly dislike hospital toothpastes! Ugh! Could really use this kit too! TFS! Sewing pattern numbers so I don’t buy one twice. An adorable red leather Brighton tape measure! A right hand glove for my arthritic hand!! Most random thing is a safety pen. a plastic whistle that was made with a 3D printer. I carry a tape measure, it has come in handy many times. A button, I am try to find a close match for. a shoehorn and a dog collar. The most random things in my purse are paper clips and band-aids. My tape measure because you never know! The most random thing in my purse is a mini tool kit! A fire starter flint. I carry one with me so if I get stuck somewhere I can always keep warm or make a signal fire. Sounds out there, but if you’ve ever traveled and broke down in the middle of nowhere as I did when much younger, you’d carry one too lol. I have an one dollar bill from Disneyland when they gave you Disney Cash in place of your cash to spend while there. I knew I wouldn’t be able to spend it anywhere else, but I will never be broke. I have a dollar bill from the Happiest Place on Earth which I received in the summer of 1972. 2 notebooks, one is for ideas so I can write them down as they come, the other is to make note of something I want to get done. A Febreze car freshener. It was empty and I put it in a pocket to remember to replace it. The most random thing in my purse is a bag of ribbons, sewing kit and a template. If I am waiting for my husband I pull it out and make bows for my granddaughters. A key chain from my niece that says “Number 1 Aunt”. A crayon, given to me by a child in a restaurant. It was her “Special Crayon, cause she made people happy with it drawing pictures for them”! How sweet! An empty fabric tissue holder. A coupon for an oil change and 12 different pens! I keep thinking I don’t have a pen I guess and drop another one in! A bottle opener… never know when you have a bottle to open. The most random thing in my my purse is my mini tape measure. It has actually come in handy quite a few times! The most random thing in my purse is a small cross my preacher gave me. a beaded frog – for good luck in vegas. A nice sized high power flashlight I use to seek out homeless people in the wood in a city park. The most random thing in my wallet is a “pinched” penny from the penny machine at our Capitol building. My grandson made it and asked me to hold on to it and I keep forgetting to give back it to him!